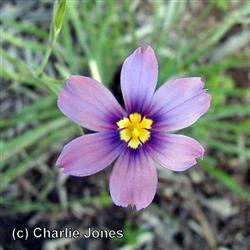 Blue-Eyed Grass is a dainty, 1 ft mounding, perennial that is related to iris, but gets its common name from the narrow, blade-like leaves. The flowers are deep blue with golden stamens at the center, displayed on tall stems. These are hardy, easy to grow plants that flower from January to June. They need little water and do well on grassy slopes, in wildflower meadows, rock gardens or around larger plants. It tends to go dormant during the hot,dry months but will return vigorously after a little rain. This versatile plant will tolerate clay soil and does well in containers too.